The dwindling number of honeybees in the US has been a constant worry for farmers in recent years – and now the White House is buzzing into action. On Tuesday, the Obama administration unveiled a new strategy aimed at protecting honeybees’ habitat. The National Strategy to Promote the Health of Honey Bees and Other Pollinatorswill seek to manage the way forests are burned by wildfires and replanted, how offices are landscaped, and how roadside habitats where bees feed are preserved. Drawing on the work of 14 agencies, along with the private sector, it aims to reduce honeybee colony losses during winter to no more than 15 percent within a decade. It also states that the government and private entities will restore or enhance 7 million acres of land for pollinators over the next five years. The strategy is based on findings from the Pollinator Health Task Force, created by the White House in 2014 to study the honeybees' decline. “I have to say that it is mighty darn lovely having the White House acknowledge the indigenous, unpaid and invisible workforce that somehow has managed to sustain all terrestrial life without healthcare subsidies, or a single COLA, for that past 250 million years,” said Sam Droege, a US Geological Survey wildlife biologist and an expert on native bee identification, as quoted by The Washington Post. But 'Beemageddon' has actually been on the White House's agenda for some time. In fact, the federal government launched an action plan on the dwindling honeybee population as long ago as 2007. President Obama himself has also expressed ongoing concern about the insects' ever-decreasing numbers. During an Oval Office meeting in 2013, Obama asked White House science adviser John Holdren: “What are we doing on bees? Are we doing enough?” That discussion started turning the wheels for the White House Pollinator Health Task Force. The president also signed off on the placement of a beehive on the South Lawn of the White House in 2009. The approval of a pollinators' garden later followed. The plight of the bees – described as a potential ecological disaster by some environmentalists and experts – has been a source of ongoing stress for beekeepers, farmers, and environmentalists, as the insects are relied upon to pollinate the plants that produce a quarter of the food consumed by Americans. A governmentreportreleased last month found that 42.1 percent of the US honeybee population died last year. However, the exact cause of the mass deaths remains unknown – and has sparked fierce debate in the US. Some have pointed the finger at a class of insecticide known as neonicotinoids, or neonics, which is used on crops such as corn, as well as on standard garden plants. Others have blamed the varroa mite parasite, along with the stresses that bee colonies endure while being carted from farm to farm during growing seasons. The Obama administration has proposed spending $82.5 million on honeybee research in the upcoming budget year – up from the current $34 million. 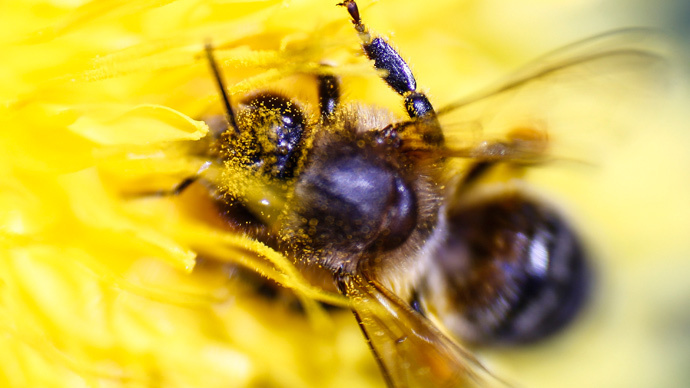 The Environmental Protection Agency (EPA) is issuing a series of studies on the effects of neonics on bees and plants; the first in a series of assessments is expected to be released later this year. The agency will also implement new restrictions on which pesticides farmers can use when commercial honeybees are pollinating their crops.